The Fandom's Favorite Fursuit Fracas, a fursuit competition organized by Exile Huscoon and Rhett Foxcoon, has finished after 88 days of voting. The winner, Frazzle (created by Frazzle and Rose Quoll) beat fellow finalist Sophie Cabra (Mixed Candy) by 135 votes to 122. The semi-finalists were Takala (Arend Studios) and Lucky Coyote (Don't Hug Cacti). The contest was organized as a series of one-on-one knockout rounds, with a simple vote deciding who would proceed to the next round. 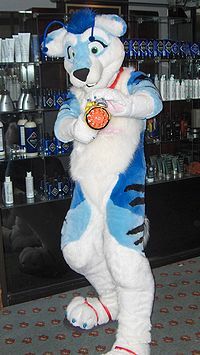 Groups were formed from 16 regions, named after those fursuits entered with the most nominations. Results were calculated on the journal, and reported on WikiFur.